-Early, 78-82, w/o the rear seal may need the large rear plate, 1.9"|50mm? 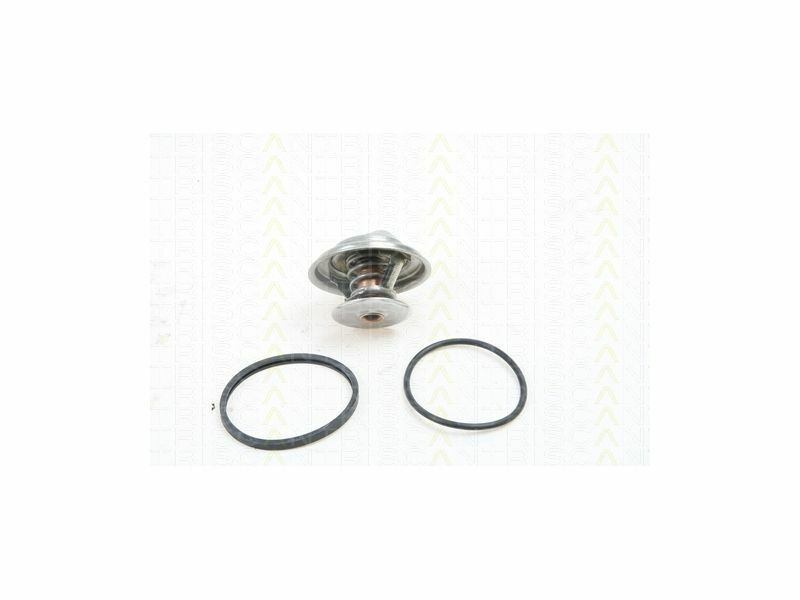 If the thermostat disc does not seal properly, the coolant will circulate in the engine which induces over heating. MB TX 18 79 D is very similar, and fits the older generation. It has a 43mm disc. Normal opening temperature is 83C, but others exist that start opening later (88C) or earlier (75C). Check on the thermostat, it is stamped. All this talk of cooling and thermostats prompted me to change my thermostat today. I installed a Devek radiator 2 years ago. I ordered a 75 degree thermostat at the same time but never bothered to install it. I began the installation today but have run into a problem I have never heard discussed on the list. My car is an 89 S4. The new thermostat came with an o-ring and another fairly hard rubber ring that looks as if it seats against the thermostat gate. When I pulled my old thermostat, it was unclear whether there was a rubber ring like this installed. There was however some residue on the upper outlet which the thermostat gate seats against that could have been the remnants of a seal of some kind. I cleaned the outlet as best as I could. When I tried to seat the into the outlet, it wouldn't fit. It appears that it should slide into the outlet with the lip of the ring overlapping the end and providing a seating surface for the thermostat. Has anyone had a similar problem? Could I have the wrong ring? Is it even supposed to have a ring? 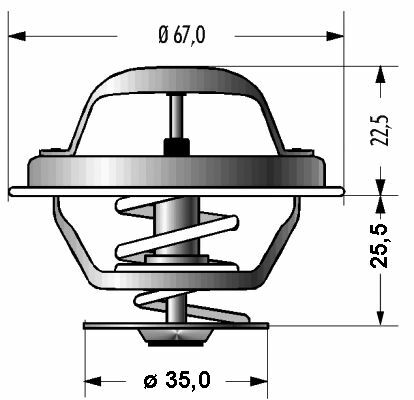 The exploded diagram in the Workshop manuals does not show this ring at all. Any insight would be appreciated. Thanks. I replaced my thermostat last week. 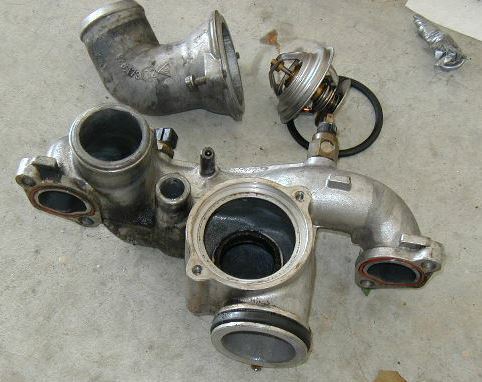 The hard rubber ring goes into the thermostat housing, but you need to pull the old one out first. The hard rubber ring has some kind of metal inside the rubber that makes it hard to get out. I had to use a pair of robo-grip pliers to get it out ( http://sis125.berkeley.edu/928/images/cool-thermo-seat-out.jpg ). I'll put a web page next week with more pictures. Thanks for the help. Your pictures are worth a 1000 words. I used a Dremel wire brush to clean what I thought was a rubber gasket that had bonded to the outlet. I exposed metal. I couldn't believe it was the outlet but having no information otherwise, was afraid to try to remove it. Your experience clearly helps me know what to do tomorrow when I continue my task. Again, a hearty thanks. Thanks for the help. I was apprehensive while using my Dremel tool on the thermostat housing earlier today, but finding out you did the same gives me comfort. I would like to refer you to George Suennen's reply on the list also. He removed a rubber clad steel ring that serves as a seating surface for the thermostat and installed a new one. While looking at your pictures, it appears that you have an old deteriorated ring still in the outlet. Using the wire brush just exposed the metal in the ring and you supposed, as I did also, that you had reached the housing. I think it is possible you only exposed the metal interior of the rubber ring. I'll let you know my experience after I work on it tomorrow. Again, thanks. OK, I've been running a cooler thermostat in my 83 Euro, but noticed it seemed a smidge happier when the temp reached the middle of the range (its typically at the lower quarter mark). So I ordered what I thought was the right assemblage of parts....and now I'm confused. 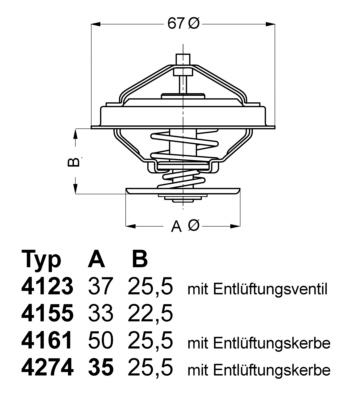 Ordered a 'normal' thermostat, a "thermostat O-ring", a "Thermostat Inner Seal" particular to Euro cars. Thermostat- Stamped 75degrees instead of 85. Hm. 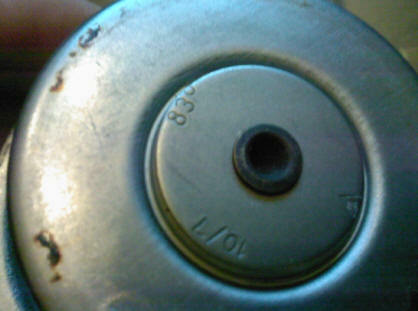 Also stamped 086, which I think is the last three digits of the Euro 5 spd WUR-- Coincidence? Should I be running the 85? O rings- The thermostat came with one in the box, and I ordered one. The one I ordered is larger in thickness and diameter. Are there two rubber o-rings that sandwich the thermostat, or did I inadvertently get the O-ring that goes at the base of the whole water manifold (928.701.631.40)? I'm puzzled about the 'seal'. It seems as though it fits in the invert of the 90 degree bend on the thermostat cover...but it doesn't fit very well over the end of the Behr thermostat that would go there. My second (and perhaps more astute) guess is that it fits inside the orifice in the block and provides a better seal for the thermostat's plunger? Any & all wisdom appreciated. Only one o-ring. It goes on the face side of the tstat facing out. So in other words it doesn't go behind the flange of the thermostat against the housing. It goes against the nose of the hose adapter that you bolt on. Also, the little notch in the thermostat outer edge goes at TDC. It's a vent for bubbles so they don't get caught behind a closed tstat. Also II, There is a smaller seal that goes in the hole behind the thermostat in the housing if your casting has the ridge for it. That came in later models than mine and maybe your Euro was still using old parts?